Top Trumps for Educators Party! 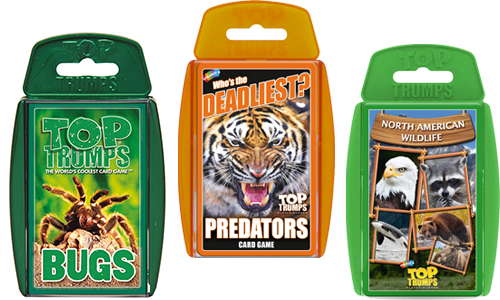 Top Trumps is back again and this time its for educators! Top Trumps are fast-paced, easy-to-learn, competitive card games, that are great tools for teaching. The games provide opportunities for critical and creative thinking and problem solving across multiple themes and content areas. Through the use of interesting informational text cards featuring colorful graphics and illustrations, children are learning and satisfying the requirements of the CCSS without even knowing it! 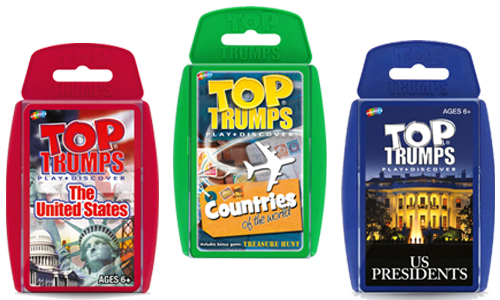 Top Trumps also helps promote positive learning outcomes in terms of literacy, numeracy and decision-making abilities. The high-interest games allow students the opportunity to practice reading skills, learn new words or mathematical terms such as units, practice number skills such as comparing heights, weights, dates, sharpen decision-making skills to make choices, develop strategic play skills, learn and retain new facts and figures through play. The mathematical games introduce mathematical practices and provide students opportunities through active play to learn to reason and model numbers and operations in a variety of concepts. Tryazon will select 100 educators for the opportunity to join the fun. Those chosen will receive six different Top Trumps games to play at their party. Learn more about the game and party by clicking the tabs below! The Common Core and other State Standards call for increased use of nonfiction resources across a variety of mediums. They call for the close and meaningful reading and manipulation of complex and challenging materials in ways that allow students to reach the highest orders of thinking and analysis. To support this requirement, Top Trumps affords solutions for your students by providing opportunities for critical and creative thinking and problem solving across multiple themes and content areas. They provide an avenue for students to develop academic and content specific vocabulary while meeting the need for differentiated learning. Through the use of interesting informational text cards featuring colorful graphics and illustrations, children are learning and satisfying the requirements of the CCSS without even knowing it! Both the new Next Generation Science and STEAM standards require a new level of rigor for today’s classrooms. Following these standards, Top Trump’s science games track the strands of science and scientific practices and have been developed to be rich in content. As called for in the standards, they allow students to explore information in the technical subjects and integrate literacy skills throughout. The science cards open new worlds of wonder and knowledge by inspiring discovery and exploration through a wide-range of topics that feature content-rich study of life, science, and earth and space concepts. The new C3 Framework for Social Studies is composed of deep and enduring understandings, concepts, and skills from the disciplines and emphasizes skills and practices as preparation for democratic decision-making. In addition, Social studies education should have direct and explicit connections to the Common Core State Standards for English Language Arts. 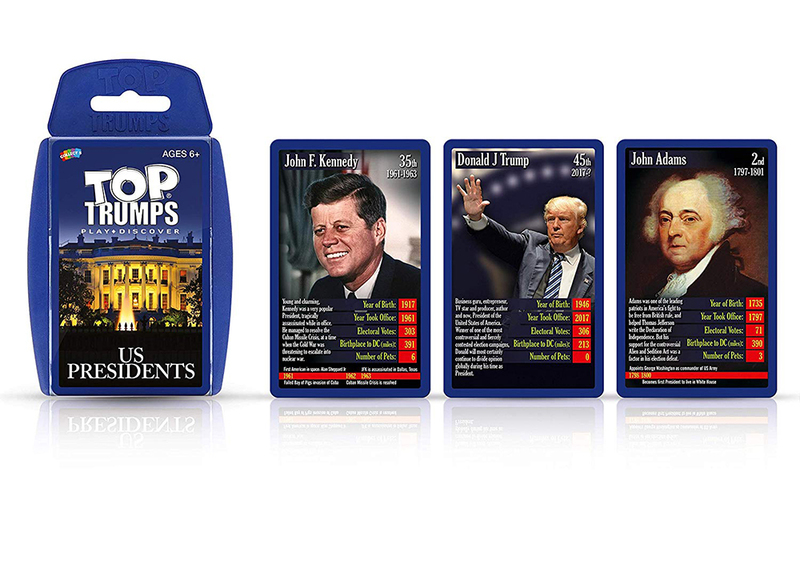 While providing the CCSS connections, the Top Trumps game packs will assist you in guiding students to draw parallels between contemporary issues and their historical origins leading to engaging classroom discussions and a deep understanding of past and present day issues all through play! All educator applications need to be received by this date. Educators will receive notification by email by this date. Those educators who are accepted and confirmed will have their party packs shipped to them. The fun begins in April, when parties will be hosted! In this overly wired-in modern age, it's good to have a good old fashioned trivia based card game for kids to play. These cards are not only good for fun head to head or group matches but also provide educational value as well. There is no need to know the info beforehand and players learn a lot of neat trivia as the game progresses. It's really super simple to play and one of those games where kids can learn neat facts without even realizing they're learning.